“Who will watch the Watchmen?” Well now i can answer my friends and me were one amongst the thousands that did. Only to come out less than happy and more than disappointed. This after going in with no expectations or fanboy attitudes. 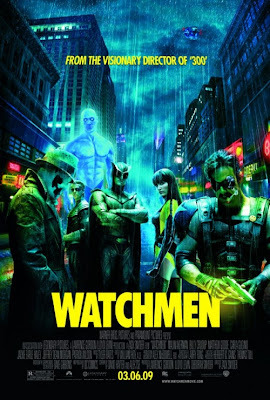 Oh ok, so your counter will be that this is a film and it should be judged on its own merit....well, in that case whatever merit it had would disappear – because for some one who hasn’t read Watchmen the graphic novel, this movie would makes less than sense. Technically it is sound, a brilliant title sequence, the CGs nice, (almost) everything thought of, but if it ever was true that the whole is less than the sum of its parts, it is with this movie And i’m not even complaining about a certain missing cephalopod!! Full points for trying, Zack ‘visionary director’ Snyder, close but no cigarette even. For a book that was written intentionally in a way as to be un-filmable, it still is. Ha!